for the village in Tibet see Qunu, Tibet. 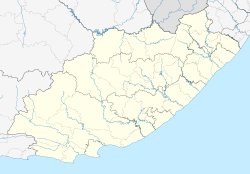 Qunu (pronounced [ˈk͡ǃuːnu]) is a small rural village in South Africa's Eastern Cape Province, 32 km (20 mi) south-west of Mthatha on the road between Butterworth and Mthatha. 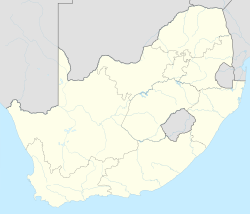 The previous President of South Africa, Nelson Mandela was born near Qunu in the village Mvezo next to the M'bashe river. He grew up in Qunu after his father was deposed as the chief of Mvezo. After his retirement, Mandela returned to Qunu. In his autobiography, Long Walk to Freedom, Mandela describes Qunu as the place where he spent the happiest moments of his childhood. The remains of four of Mandela's children were originally buried here, but were exhumed by one of his grandsons, Mandla Mandela. Mandla reburied the remains in Mvezo, the village of which he was chief. On 3 July 2013 the Eastern Cape high court ruled that the remains should be moved back to Qunu. Shortly after this, King Buyelekhaya Dalindyebo relieved Mandla of his duties. On 15 December 2013, Mandela was buried in Qunu following a state funeral, on his family's property in a spot he personally selected. Panoramic view of Qunu and its surroundings. ^ a b "Sub Place Qunu". Census 2001. ^ "Madiba heads back to Qunu". Mail and Guardian. Retrieved 29 May 2012. ^ "Mandela funeral brings together world's most powerful people". The Guardian. Retrieved 6 December 2013.